The Hall China Company (“Hall China”) is a leading manufacturer and supplier of ceramic products, including chinaware and hollowware as well as specialty products to the food service industry. 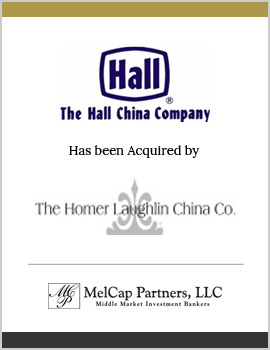 MelCap Partners acted as the sell-side advisor to Hall China. The shareholders of Hall China sold the Company to The Homer Laughlin China Co., a strategic buyer located in Newell, West Virginia. The sale of Hall China to Homer Laughlin creates the largest domestic manufacturer of ceramic china products in the United States.